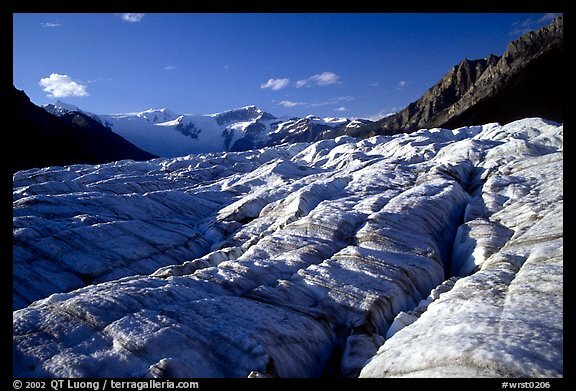 Wrangell Saint Elias National Park is a park of enormous size, even larger than Gates of the Arctic National Park. At 13.2 million acres (528 thousand squares kilometers), it is six times the size of Yellowstone, and larger than Switzerland. 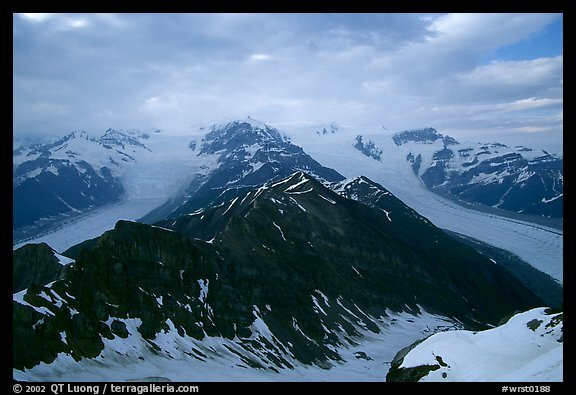 While the Brooks Range mountains that lie in Gates of the Arctic are of modest elevation, Wrangell Saint Elias National Park includes 9 of the 16 highest mountains in the US. 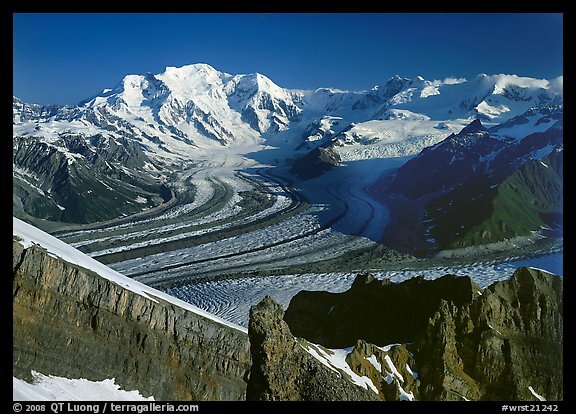 Immense glaciers descend from those mountains, such as the Malaspina which alone is the size of Yellowstone. The park is so vast that many are just content of photographing it from the air, but I wanted to create a large format image that showed some of the Park’s vast glaciers. The scenic Mc Carthy road posed no particular problem for my rental compact car, despite the fact that the car rental companies prohibit driving there. I parked at the footbridge at the end of the road, crossed the bridge on foot, then hitched a ride to the impressive abandoned old copper mining town of Kennecott, situated right above the glacier of the same name. After visiting the ghost town, I hiked to a campsite 1.4 miles north of town to spend the night. I planned to spend the next few days climbing Mt Donoho, a peak which lies like an island between the Kennicott and Root glaciers. The first day, I crossed the Root glacier. Since the ice was not snow-covered, there was no danger of falling into a crevasse after a snow bridge collapse, yet navigating around the crevasses and glacial streams proved somehow tricky. The ice was not slippery most of the time, but at one point I had to put my crampons on to tackle more steep slopes. As I was making many photographs along the way, the glacier crossing took a whole day. I set up a base camp at the base of Mt Donoho. On the second day, I proceeded up the steep scree slopes of Mt Donoho. As I arrived at the top in late afternoon, I was disappointed to notice that the air was extremely hazy, due to distant forest wildfires. The light over the Wrangell range was also not favorable. Although I didn’t carry my sleeping gear with me, having left it at base camp, I decided to spend the night there, in order to capture a hopefully better photograph in the morning. I had my stove with me (an habit left over from my alpine days), so I was able to melt some snow to make water and cook myself a hot meal. I then rearranged rocks to make a flat surface and shelter myself against the wind, slipped my legs into my backpack, covered myself with a survival blanket, and settled for a rather cold Alaskan mountaintop night. I wasn’t too lucky with sunrise for which I had been waiting, as low clouds blocked the light. Since I didn’t sleep too well during the night, I drifted back to sleep in the warmer temperatures. Eventually, in the early morning, with the clouds parting, the light got brighter. Upon waking up for good, I was rewarded by a commanding view. As I had hoped, the summit of Mt Donoho provided me with a viewpoint which made it possible to picture the sheer size of the glaciers and the Wrangell range.